This is Mel Brooks’s version of Count Dracula story, released in 1995. All I can say is funny, funny, FUNNY! Just thinking of it makes me smile. 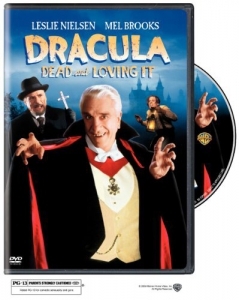 the imposing but a little clumsy Dracula who keeps messing things up, Peter MacNicol as an unsuspecting London solicitor coming to Transylvania, and Mel Brooks himself as Dr.
Abraham Van Helsing, the vampire-catcher. I could list all the actors, each one of them did a great job. around the house for several days, if not weeks. window that Lucy, another character, happens to close just when he is about to fly in. BAM!! Certain episodes may not be appropriate for children though (blood, gore, sexuality), so be warned.